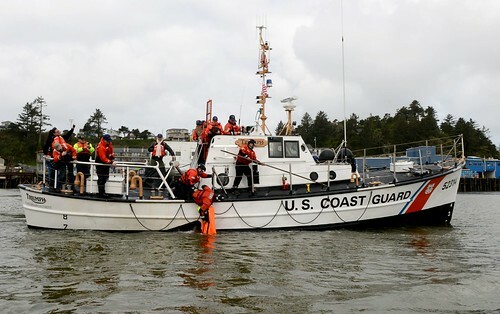 Sam Johnson and Bruce Jones, executive and deputy directors of the Columbia River Maritime Museum in Astoria, Ore., kneel with Chief Warrant Officer Christopher Boss, commanding officer Coast Guard Cutter Bluebell, and Rear Adm. David Throop, commander, Coast Guard 13th District, behind a decommissioned propeller off the cutter Bluebell, April 17, 2018. 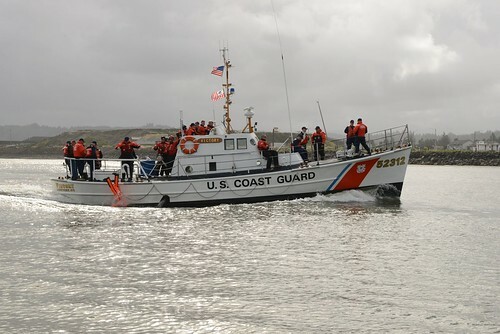 U.S. Coast Guard photo by Petty Officer 1st Class Levi Read. 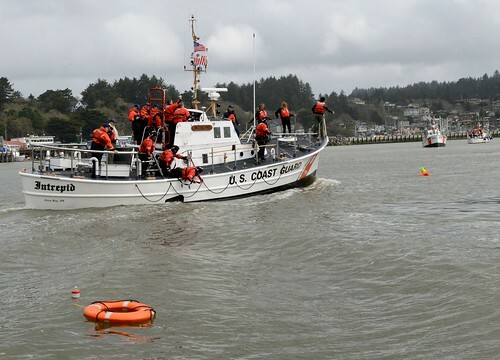 ASTORIA, Ore. – A decommissioned propeller from an Oregon-based Coast Guard cutter was presented to the Columbia River Maritime Museum during a brief ceremony held at the Astoria museum, Tuesday. 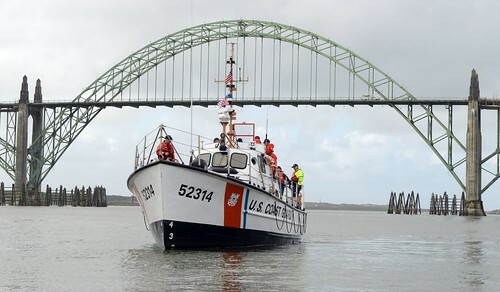 Rear Adm. David Throop, commander, Coast Guard 13th District, presented the decommissioned propeller from the Coast Guard Cutter Bluebell, a 100-foot inland river buoy tender homeported at Swan Island in Portland, to the Columbia River Maritime Museum as a historical representation of the cutter’s service on the Columbia River. 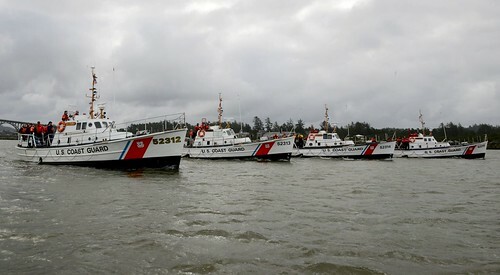 Commissioned, April 4, 1945, Bluebell is the second oldest still-serving cutter in the Coast Guard fleet. Bluebell personnel have served in the Pacific Northwest servicing aids to navigation along the Columbia, Snake and Willamette River systems for 73 years. 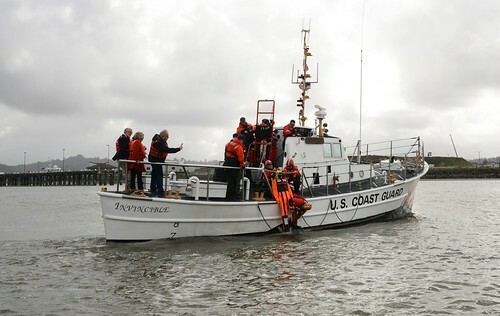 The main mission of the cutter is to facilitate safe commerce on hundreds of miles of inland waterways. More than $23 billion of waterborne cargo moves up and down the Columbia, Willamette and Snake Rivers each year, and the work that the Bluebell does in maintaining the aids to navigation keeps the ships that carry this cargo safe. 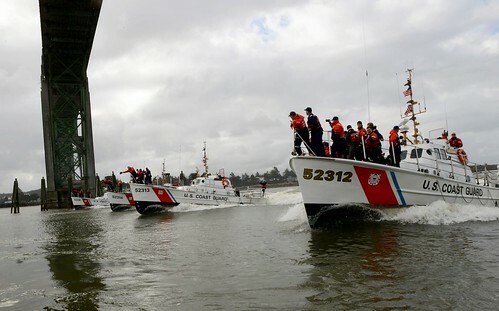 The crew services more than 420 aids covering 500 river miles on three major rivers beginning at the mouth of the Columbia River on the Oregon/Washington border. More than 300 miles up the Columbia River in Kennewick, Washington, lies the Snake River, which the crew covers all the way to Lewiston, Idaho. The last of the three rivers is the Willamette, which meets the Columbia near Portland and has 35 miles of Bluebell maintained aids. When traveling from Portland to Lewiston the Bluebell must pass through eight individual navigational locks in order to maintain buoys and aids to navigation structures. The Bluebell is responsible for 23-percent of the entire 13th District’s aids and buoys. The propeller was removed from service after the vessel received a new propeller shaft and propeller of an updated type and material. The Columbia River Maritime Museum’s mission is to collect, preserve, interpret and display the maritime heritage and history of the Columbia River and surrounding waters.